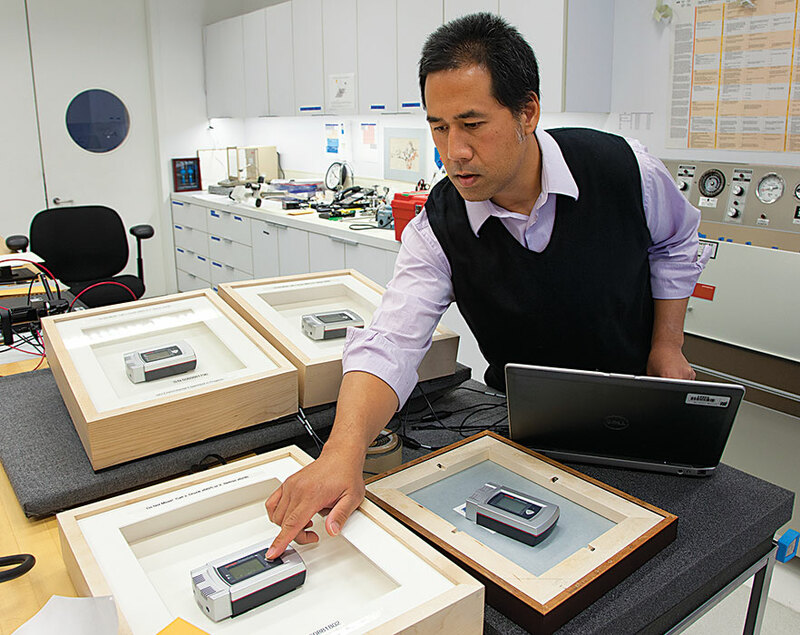 GCI Assistant Scientist Vincent Beltran testing exhibition monitors in Institute labs at the Getty Center. Photo: Scott S. Warren, for the GCI. Preventive conservation—the policies and practices taken to assure the protection of cultural heritage from environmentally induced damage—has been a major focus of Getty Conservation Institute work since the GCI opened. Managing risks to cultural materials through actions designed to prevent or at least mitigate the potential for damage is reflected in the full range of the Institute’s work, from built heritage to museum collections. While preventive conservation principles are embodied in all GCI activities, a vital area of Institute research, education, and dissemination programs over the past three decades has been the preventive conservation of collections. The first ten years of GCI research in preventive conservation were a concerted effort both to complement work taking place elsewhere and to fill knowledge gaps in the field. The Institute’s far-ranging research included investigations of atmospheric pollutants, mechanical systems and energy conservation, the moisture-buffering capacity of museum storage cases, pest control through anoxia, and seismic mitigation measures for art objects. An examination of the practical aspects of preventive conservation shows the complexity of the concept of the museum environment, an ecosystem comprising both physical and organizational layers. While research is clearly essential for a better understanding of collection materials and their preservation, preventive conservation is fundamentally an applied pursuit, using scientific knowledge as a basis for policies and practices that contribute to safe collection environments. For this reason, the GCI’s interest in preventive conservation has always extended well beyond the lab and into the operations of the museum itself. 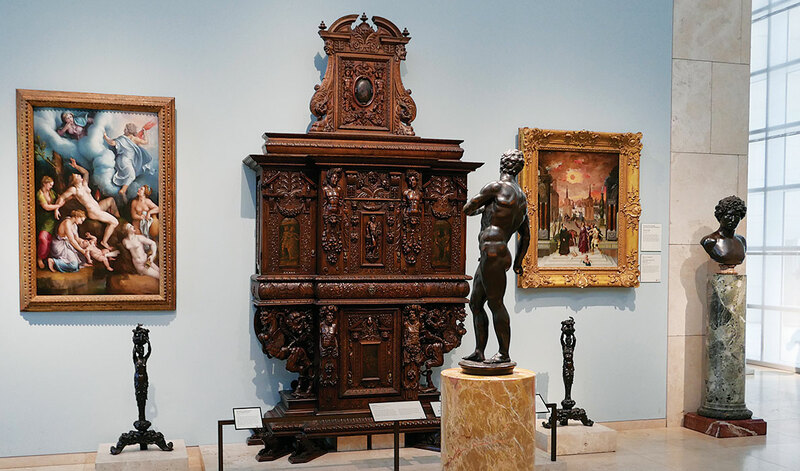 Dealing effectively with a collection’s physical environment requires knowledge of the larger macroclimate of a museum, the type of building it occupies, the systems within the building, and the microclimates of galleries, storerooms, and showcases. This physical environment in turn is impacted by the organizational environment—the mission, policies, and operations of the institution itself as well as the audiences it serves. Within this complex and dynamic framework, the museum environment is clearly more than a series of technical problems that can be addressed by scientific expertise alone. Instead, collection environments require an expanded view of the role and influence of conservators within the entire museum ecosystem. This concept was a basis of the Institute’s first training program in preventive conservation. While GCI research was tackling problems associated with the physical aspects of the museum environment, the Institute’s Training Program (a precursor to today’s Collections Department) was engaged in projects promoting the larger concept of preventive conservation practice and the symbiotic relationship between the physical environment and the organizational environment. Emphasizing the conservator’s role in potentially influencing institutional policy making, the GCI launched a series of training projects in the 1990s, beginning with Preventive Conservation: Museum Collections and Their Environment. This course was designed to encompass both technical information and the management skills essential for implementing preventive conservation within museums. One significant feature, unique for the time, was the focus on museum buildings and their systems and on the role conservators can play within museum design, building, and renovation projects to ensure that preventive conservation concerns are addressed early in the design and construction process. The course also broke new ground in bringing together participants who worked in different climates and different types of museums and heritage sites around the world. One of the authors, Sarah Staniforth (an instructor on all but the pilot course), recalls how much she learned from participants as discussions explored the relationship between the climate inside buildings and local exterior conditions. This was one of the first courses to address head-on the issue of high energy consumption by museums in the developed world. Attitudes changed significantly during the time period when the course was offered. In the early years, some participants from major museums in North America and Europe had doubted whether museums even needed to consider energy use, arguing that the high value of the collections justified the expense of tightly controlled environments. By the end of the decade, however, there was a much greater enthusiasm for the possibility of achieving appropriate collections conditions with methods that minimized global environmental impact. By the early 2000s it was clear that responsible stewardship of collections could no longer be dictated by a single approach; indeed, sustainability—a word just coming into widespread currency—required flexible thinking and a pragmatic approach. Within the conservation field, the notion of an ideal environment for collections was replaced by the concept of an appropriate environment. In place of a universal standard (that was neither quite universal nor a true standard), a localized approach was taking hold. With this approach, preventive conservation solutions were geared to the specifics of a given climate, museum building, collection, set of identified risks, mission, and range of operational priorities, as well as to the available resources. Defining appropriate environments and strategies to support them became an important part of GCI environmental research. The Institute’s contacts with colleagues in institutions worldwide increased, creating new opportunities to address preventive conservation challenges in new contexts. From the late 1990s until 2010, the GCI pursued an ambitious program of research focusing on development of environmental management strategies for collections in hot and humid environments. Contrary to the situation generally encountered in temperate regions—where most of the previous research on the museum environment had been undertaken—materials in subtropical and tropical regions face greater risk from biological and microbiological attack than from factors inducing mechanical or chemical damage. The great expense of installing, maintaining, and operating high-tech mechanical systems for cooling and dehumidifying has always presented a formidable challenge to collection caretakers in hot and humid regions. Over more than a decade, the Institute conducted research on the development of economical and sustainable environmental management strategies that could significantly reduce the potential for biodeterioration in these climates. Research examined alternatives to conventional air-conditioning systems by investigating the feasibility of controlling high relative humidity through a combination of dehumidification, ventilation, and air circulation. The North Pavilion Sculpture and Decorative Arts Galleries at the J. Paul Getty Museum. A safe museum environment balances the needs of a disparate range of materials and object types with the requirements for visitor comfort and enjoyment. Photo: Foekje Boersma, GCI. Meanwhile in Europe, other researchers were investigating practical low-energy methods of keeping relative humidity as constant as possible. In the United Kingdom, researchers and conservators developed conservation heating as an environmental management strategy, drawing upon the experience of the World War II evacuation of the National Gallery collection to a slate quarry in North Wales. Conservation heating was found to be particularly suitable for the numerous collections housed in historic buildings where controls on existing heating systems could be changed from thermostats to humidistats. At the same time in Scandinavia, passive methods of environmental control were being developed for storage spaces and for microclimates in display areas. These developments coincided with growing recognition in the conservation field that high-tech heating, ventilating, and air-conditioning systems, often previously and widely considered the museum standard for collections, actually could be deterrents to good environmental management when the climate control systems were not appropriate to given situations. The faith placed in highly mechanized environmental control quite often ran up against the realities of local climates, building and collection typologies, material tolerances, and resources (both human and financial) available to support such technology. While considerable professional attention has been given to the appropriate levels of relative humidity and temperature in collection spaces, other aspects of preventive conservation are also critical to the debate on sustainable museum environments. One important concern is lighting used in exhibitions. Over the past decade, the GCI’s Museum Lighting Research project has pursued an ambitious research agenda on safely illuminating exhibited works of art. Innovations in lighting, with significant cost- and energy-saving potential, continue to be tracked and investigated. In the second decade of the twenty-first century, the very idea of what constitutes a suitable museum environment and of what level of resources that environment should consume is being debated and redefined by the museum profession. The international organizations representing conservators have acknowledged the need to reconsider environmental policies and practices for collections as part of the museum world’s commitment to sustainable practices, including reduced consumption of energy resources in maintaining tightly controlled exhibition and storage climates. The quest for sustainable practices has also highlighted an outstanding issue that to some has never been adequately addressed: the field’s limited understanding of the damage that may occur to some hygroscopic materials in collections, particularly in composite objects in environments with wide or greatly fluctuating ranges of temperature and relative humidity. Indeed, the degree of risk to which hygroscopic materials may be subjected is currently among the fervently debated issues in conservation, and it remains a barrier to a full embrace of broader environmental parameters. As the IIC and ICOM-CC declaration states, the issue of environmental requirements is complex. Given the critical deliberations about what constitutes safe and sustainable environments for collections, the GCI is pursuing an ambitious research and education initiative called Managing Collection Environments (MCE), a collaboration of the Collections and Science departments combining research, field activities, education, and dissemination. MCE’s research program has several components; one addresses the often cited need for more investigation into the hygroscopic behavior of materials under fluctuating relative humidity levels, to help understand the conditions under which irreversible damage occurs. Since one criticism of previous research on hygroscopic materials has been that tests conducted in laboratory settings cannot adequately predict the potential for damage in actual objects in museums, a goal of the initiative is augmenting lab-based microscale research with empirical studies of climate-induced damage in the field. Relying on conservation colleagues at various sites, this collection “epidemiology” study will draw upon and assess both scientific and anecdotal data on suspected environmentally caused damage over time, potentially improving understanding of conditions that promote irreversible materials damage. Complementing the initiative’s lab- and field-based activities, the Collections department will also develop a range of courses, workshops, and seminars for conservation and allied professionals, including architects, engineers, collection managers, and facilities managers. Environmentally and economically sustainable approaches to preventive conservation will remain important for collection-holding institutions for the foreseeable future. The evolution of GCI work in this area reflects an understanding of preventive conservation that is both expanding and evolving, with respect not only to our scientific understanding of how to manage damage from environmental sources but also to the opportunities presented for the sustainable stewardship of collections. Kathleen Dardes is head of GCI Collections. Sarah Staniforth is president of the International Institute for Conservation of Historic and Artistic Works and is a trustee of English Heritage.